In the Press Releases IBFAN had expressed concerns about GAIN's application for NGO status at WHO, a status that gives NGOs access to meeting of the WHO governing bodies. IBFAN felt it was inappropriate for such a public-private body to be influencing health policy setting. In its statement GAIN has given no rationale for its application. IBFAN is not seeking to eliminate food businesses from the development scene but is simply saying that businesses who are the providers of commodities and those who work on their behalf, should be kept away from the policy setting process. GAIN is well aware that malnutrition is the perfect cover for the creation of profitable ‘businesses’ and that its promotion of business ‘partnerships’ in the conquest of child malnutrition will allow corporations to have unprecedented influence over national, regional and global policies. 1 GAIN's claims to be 'independent." While it may be true that GAIN does not receive money directly from private companies and that they are registered as a non-profit organisation, GAIN's Board contains several corporations, including Brittania Industries (India), a major snack producer that was recently linked to an opinion piece in the BMJ, claiming that the : "Law on infant foods inhibits the marketing of complementary foods for infants, furthering undernutrition in India." GAIN's Partnership Council, includes other major food corporations, including IndoFoods (Indonesia) a company producing instant complementary foods like porridges and biscuits for babies 6-12months. The marketing of complementary foods is not regulated in Indonesia so is not covered by the law. So the instant porridge advertisements are on lots of TV ads, magazines and radio spots etc. 3 GAIN claims to work in partnership with governments yet GAIN's Policy Briefing on the proposed Kenyan Law in October 2012 showed how it is putting pressure on governments in developing countries to weaken legislation and specifically permit the promotion of baby foods and involvement of companies in education. 4 GAIN is using the image transfer from civil society organisations –which it claims represent the poorest and most marginalised - to suggest that its partner companies - who 'target' the poor with products - are similarly working in the best interests of the poor. This is disingenuous. 5 GAIN, global corporations and international trade Many big food corporations now claim to be working to improve nutrition, but few acknowledge the harm that they do. IBFAN has yet to see GAIN denounce the ongoing Code violations of its partner companies or demand that all companies manufacturing or distributing baby feeding products should stick to the two roles given to them by the Global Strategy on Infant and Young Child Feeding (2002): to manufacture safe products and to comply with the International Code. (1) Instead, while claiming to work with small ‘local companies’ GAIN enters the world's most important arenas of public health policy setting, the World Health Assembly and Codex Alimentarius, where food standards and guidelines for international trade are set. At Codex GAIN is trying to carve out a bigger role for these very same companies who are continuing to violate the International Code and WHA resolutions, thus placing child health at risk. In its submission to Codex GAIN is also lobbying for companies to provide education materials on infant and young child feeding. In this GAIN is not only ignoring the two roles assigned to the industry by the decision of the World Health Assembly but also the many calls from the World Health Assembly that governments should ensure that such initiatives are protected from conflicts of interest. 6 It is disingenuous for GAIN to claim that its promotes breastfeeding and actively supports the International Code of Marketing of Breast Milk Substitutes and the subsequent relevant World Health Assembly resolutions when it is lobbying so actively against these Resolutions. 7 GAIN's claim to rank as number 50 in the top 100 NGOs globally seems to be based on an assessment by the Global Journal founded in June 2010 in association with 20 friends and business angels, most of them individuals related to the Media Industry from France, Switzerland, Germany and Norway. Commercial enterprises 44. Manufacturers and distributors of industrially processed foods intended for infants and young children also have a constructive role to play in achieving the aim of this strategy. They should ensure that processed food products for infants and children, when sold, meet applicable Codex Alimentarius standards and the Codex Code of Hygienic Practice for Foods for Infants and Children. 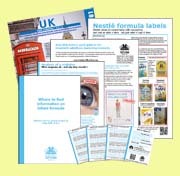 In addition, all manufacturers and distributors of products within the scope of the International Code of Marketing of Breast-milk Substitutes, including feeding bottles and teats, are responsible for monitoring their marketing practices according to the principles and aim of the Code. They should ensure that their conduct at every level conforms to the Code, subsequent relevant Health Assembly resolutions, and national measures that have been adopted to give effect to both. Appropriate feeding for infants and young children 15. Providing sound and culture-specific nutrition counselling to mothers of young children and recommending the widest possible use of indigenous foodstuffs will help ensure that local foods are prepared and fed safely in the home. The agriculture sector has a particularly important role to play in ensuring that suitable foods for use in complementary feeding are produced, readily available and affordable.